The quickest way how to tell your friends where you are at the moment. Locus calls your favorite messaging app and sends a short message with your position. 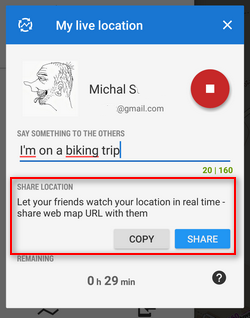 This feature enables sharing your location continuously in the real time with anybody in the World who has access to the internet. It shares a URL leading to a microsite where your location is displayed on a map and updated every 15 seconds. if you like, insert a message to those who will track you and then just tap the green START button. the URL can be opened in any internet browser. A menu on the left shows your actual speed and elevation. 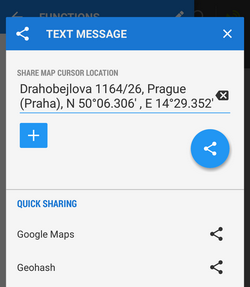 Text part - pre-filled by Locus Map, contains address, GPS coordinates and is editable. Geohash (URL) - coordinates are coded in a short URL to open in the Geohash.org website. 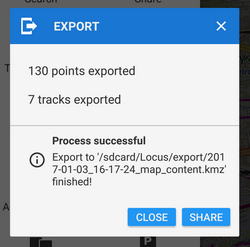 It serves as a hub of a few position-displaying services - OpenStreetMaps, GoogleMaps, Geocaching.com, offers download of a GPX file with your position or export to a Garmin device. blue - confirms action and offers available sharing services - SMS, E-mail, Dropbox, Skype, Facebook etc. 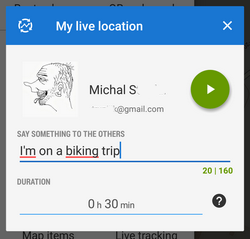 Directly calls available messaging apps to send Google Maps or Geohash URLs through them without further editing. 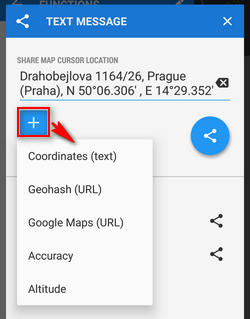 Quickly shares the map cursor position with all other map apps installed in your device, e.g. Google Maps, Waze, Sygic etc. Shares the map cursor position on your Facebook profile. Facebook login and confirmation that you allow Locus Map to write on your wall is required. 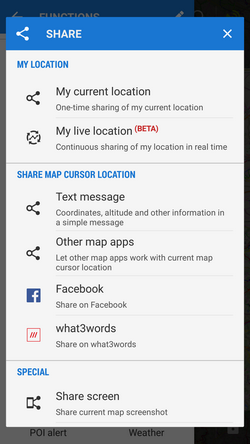 Sharing the map cursor position decoded in what3words system. 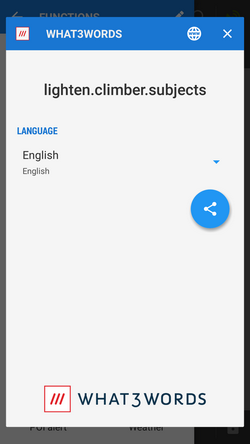 Several languages are supported. Share button calls all available services for sharing files.